First, let’s not beat around the bush here. We’re not shooting for utter objectivity. This is a wholly biased opinion of Microsoft’s Publisher program, and you know what’s even better? I’ve never touched Microsoft Publisher. So why should you listen to me, someone who doesn’t even know how to place a BMP into Publisher? Here’s why. I’ve dealt with Publisher both as a designer and as a prepress professional in major print shops — for more than one and going on to two decades. I’ve seen first hand what happens when clients want to get a project created in Publisher professionally printed. The short answer? It can’t be. When I proposed this piece to my editor, the first sentence was, “I hate Microsoft Publisher and want to spread the joy of that seething hatred throughout the world.” This, I’ll freely admit, was a tad hyperbolic. In truth, I want to spread the joy of that seething hatred throughout the galaxy. Microsoft Publisher is excellent when used for what it was designed to do: create simple business materials like brochures, letterheads and posters to be produced in-house. It’s well-integrated with Microsoft’s Office suite, and likely saves companies money by not having to outsource all of their internal and marketing materials. Problems arise when Publisher’s boundaries are pushed, which is true with any program. 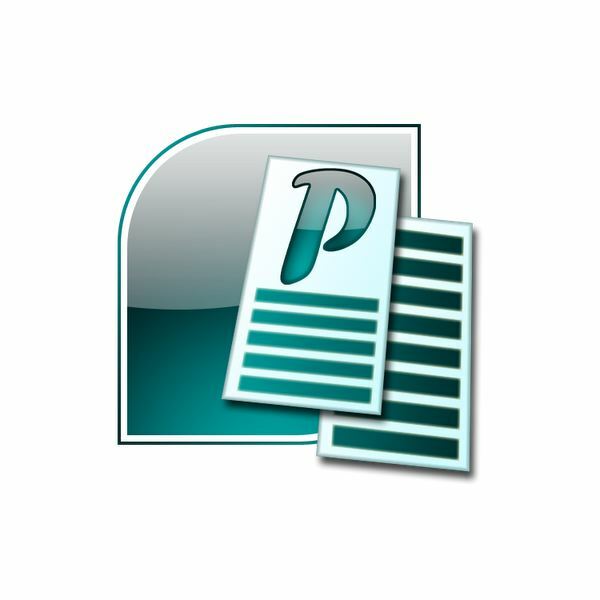 Since the 2007 version of Publisher, it’s been able to produce PDF files that printers can use. I honestly can’t tell if it can do this natively or if you need to install an add-on. One of Microsoft’s webpage’s on Publisher claims it’s built in, while another clearly states that you need an add-on (or “add-in” as Microsoft puts it). This is a good thing, but it’s not quite good enough. It’s like adding an indexing feature to Notepad because some people have decided they want to use Notepad to write non-fiction books. The feature is there, but it’s highly unlikely that the audience is trained in using it properly. However, I’m not going to knock it. Good things about Microsoft Publisher for the printing world: current versions can write PDF files to the X-1a standard. A few years ago I was working on a promotional book. My client, bless her heart, had written much of the copy and had a chart laid out for me to place in the book. Great! I said. Send it over! When I saw the file extension, I facepalmed. It was .pub. Everybody in the industry knows what .pub means. It means it’s time to pour a stiff drink. There is no Publisher version for Mac, and .pub files cannot be opened by any other program, unlike less-proprietary file types such as rich text or encapsulated PostScript (yes, I know EPS is proprietary, but loads of programs are licensed to work with it). There was literally nothing I could do, no kludge at all, that could break me into that file. My client had sent me the binary equivalent of a doorstop. I called the client and asked if she could save the file in any other format. She had the 2003 version of Publisher and couldn’t save a PDF, and couldn’t tell if she actually even had any other file type options. As designers and printers, our job is to either create good files, or to make good files out of what our clients give us. That’s what they pay us to do, and we’re happy to do it. I love prepping files and making them perfect. Part of what we do is education. If you, as my client or as a designer, know how to set up your margins or how to lay out a folder or how to best save a file, then the chance for mistakes lowers greatly as your project moves through the production process. With pre-2007 Publisher, any education was utterly impossible. On top of that, Publisher users are often pushed into the job of design as an addition to their regular office job, and can be completely unfamiliar with the printing process. Imagine the difficulty of explaining to your client, who sent in a Publisher 2010 PDF saved in X-1a (i.e., doing everything “right” so far) that all of their images are low res and won’t print properly. This can be done, and we’re experienced enough to do it so gently that you don’t feel embarrassed about not knowing, but much of the time the client is so new to everything that they simply can’t process the new information in a timely manner. Oh, and you know the most important, absolutely inviolate rule of printing? You get that on press on schedule. If you don’t, thousands of dollars are lost. Publisher’s not made for real printing jobs. It’s made to print composite files for in-house style inkjet and laser printers. Microsoft has had to add basic features like crops and PDF output in the latest versions because it likes to push idiocy like this handy chart for deciding when to use Publisher. Graphically-rich catalogs? Publications to be commercially printed? If someone sent me an entire catalog done in Publisher, I’d get out the special knife from my bottom drawer and commit hara-kiri. Seriously. That’s like drinking and driving folks. Don’t do it. Seriously, I’m sorry if you have to use Microsoft Publisher to design projects to send out for printing. In-house? Sure, fine, knock yourself out. But just realize that every time a commercial printer gets a Publisher file, a kitten dies. There are even better options, and ones that don’t cost an arm and a leg like Adobe’s CS Suite (which is the best option). PagePlus does X-1a PDFs as well. Or if designing isn’t your primary job and you’re tired of trying to answer questions from the printer and fixing the file, consider pleading with your boss. It’s likely costing the company more in lost productivity to have a non-designer produce materials than it would to outsource. Keep yourself happy. Keep your designers and your printers happy. Relegate Microsoft Publisher to the office laser printer where it belongs.